Hoardings, no-parking zone signs, bansigns and annoying noises from construction vehicles. Thats the first impression when you come from the main street to the campus in search of a parking place. Since I began my studies in the Wintersemester 2011/12 there hasn´t been a period of time in which nobody was puttering around, digging the ground up, or burrowing in need of building another structure. Katharina: In the course of your studies did you ever see the campus without any construction sites? 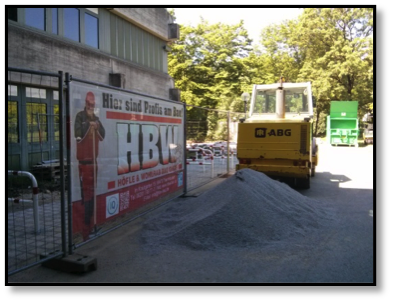 K.: Right now there are many building sites all around the campus grounds, the "Parkdeck", the arts-and music-building and so on. Do you notice these sites? Do they compromise your studies? T.: Yes, the noise in the arts-and music-building disturbs my concentration a lot. Also, you have to get up really early to get a good parking place near the main buildings of the campus, otherwise you might be too late for seminars or lectures. K.: How do these construction sites affect normal life on campus? 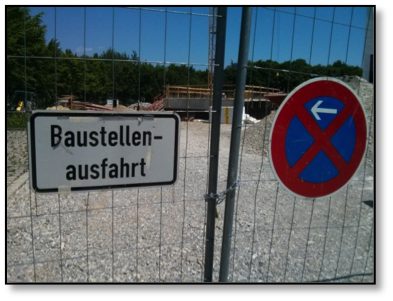 T.: In the summertime you can´t relax near the campus because the noise from the construction sites are too loud. Apart from that it is really hard to just chill in between study times. You just can’t really relax. It’s annoying. K.: Do you benefit from the new buildings? T.: The art-and-music-building made it possible that each and every seminar or lecture could be held on campus grounds. Students like me no longer have to drive to “Schillstraße” (City centre) anymore, which is great! Because of this there are less problems with time and other seminars or lectures. 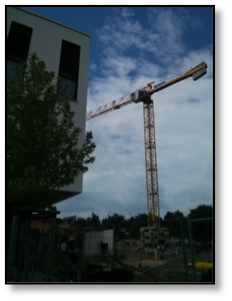 K.: Do you think studying at the University of Augsburg gets easier or better for new students because of all those new buildings (for example the new Mensa, new Cafeteria and the new art-and-music-building)? T.: The "Studentenhaus" permits the beginners to find a quiet place to plan their presentations and relax between the lectures. The new art building may make it possible for the chair of arts to offer more seminars for the art students, like a "Keramikkurs". This way the students get their credits earlier and can concentrate more on their last exams at the very end of their studies. Also, there may be more places to present works of art like the “Pappmache”-groupwork.